Would you take a look at my plan for the next 5 weeks of long runs and see what you think? My main thing is the 20- should it be 2 weeks out or 3? I usually do 12: 2 weeks out and 8 : 1 week out. March 29: 10 mile race + add on to do 18? 16? April 5: 20 (or do 18?) 12? I don’t know if I’ll really do a 20 miler. Maybe 18. My goal: to finish and have fun. No real time/pace goals, but I do hope to finish under 5 hours. But mainly, I want to enjoy it and take in the experience. Hopefully see family along the way! And hopefully find lots of people to hop in and run with me. I tried the LUNA macadamia flavor today – YUMMMMMIEEEE in my tummy!! smoothie mania – well, inspired by Amanda over at Run to Finish, this is my 3rd day of smoothies. Topped w/ whip cream and that is good stuff! Check out the long legs on my peanut! Born to run indeed! Look at those legs!! !As training goes, I would err on the side of caution and do the long run (whatever it ends up being) three weeks out. In preparing for my longest race ever (30K in three weeks) I’ve adjusted my plan to give myself a bit of a taper for two weeks. Initially I had planned on increasing my long run by 2k every week right up to the Sunday before the race, but now I think I will do a shorter run one week out and be happy with getting a bit of extra rest prior to this milestone race.Then again, you are a seasoned marathoner and know better than I ever will what works for you. Either way, I hope you have a great time in both training and racing! If you’re not planning to run Boston at race pace, then I think doing the 20 2 weeks prior should be ok. Especially if you take it easy on that run and then let yourself recover the next 2 weeks. If you need a partner for any of the long runs, just let me know. I’m not training just yet but I’ve been trying to stay on top of them. Nick is ready to run!! What an adorable kid. Plus, pictures of boys and babies melt my heart. :o)I think a 20 miler is critical for first timers, but not as much for experienced marathoners. If you’re really running it just to finish and have a great time, it’s probably not as important. I’m with Denise. 20 miler 2 weeks prior is fine (I’m pretty sure that’s what I did) anyway just take it easy since you’re not running it for real anyway. Holy s#*t that kid is a runner!! 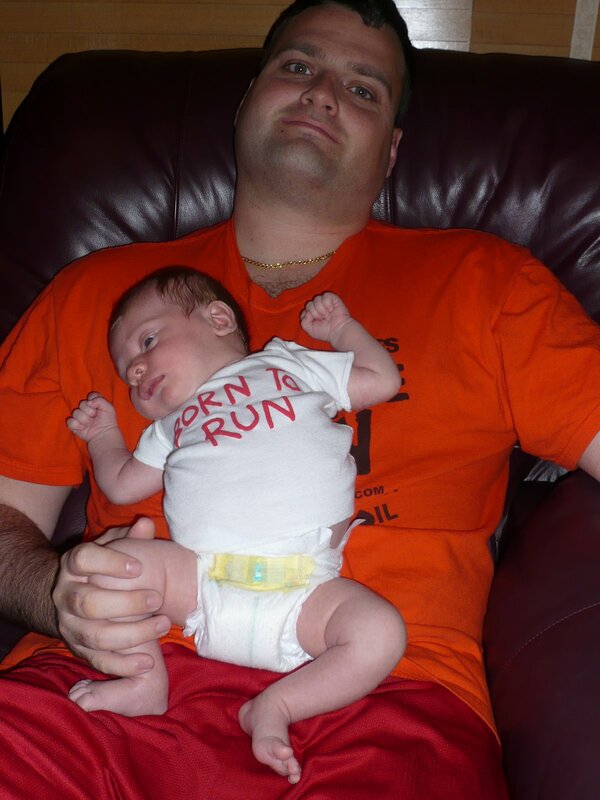 Love the Born to Run onesie! Such a doll.That seems like a very reasonable training plan! You’ll do great. Long run 2 weeks out should be fine *as long as you don’t push it*. Just don’t push the pace. The key is being able to recover, so maybe 18 would be plenty, depending on how you feel. You’re going to be fine one way or the other in this marathon… so no worries! :)Love the onesie! Love the little guy’s tee! I think you have a good training plan too. I’m looking for a summer marathon and am hoping to have the same attitude: no pressure, just run and enjoy. Loving being a mama? I always do my last 20 3 weeks out… then taper from there. Looks like you have it figured out 🙂 its going to be the best marathon to run and enjoy!!! You will have a blast 🙂 what is this macadamia luna you are talking about?!?! I love the new pictures! Your plan looks great. I actually like a shorter taper better. I don’t know ANYTHING about marathon training, so I am just going to stand along side and cheer you on! You are doing great!And the little man is getting so big! Look at those legs!! 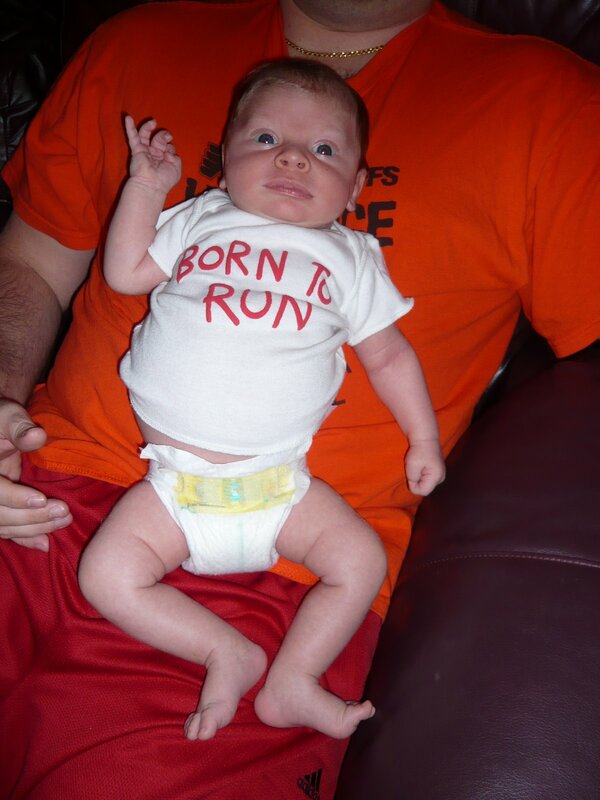 Definitely BORN TO RUN! That kid has running legs for sure!I usually do my last 20 3 weeks out, but that’s just me. I like to give my legs a lot of time to recover. I run way better on rested legs.Either way, you’re going to do great! I can’t believe you’re running BOSTON! I love the born to run shirt!! So cute! I don;t know about the running – I would say try to go for two 18 milers and see how you feel. If you can get to 20 miles then do it, otherwise save your energy! i just came across your blog and your baby is precious! congrats. i’m expecting my first late september and trying to keep up with some running. it seems like you were successful with it. any advice for running while pregnant? Those are some looong running legs! !I need to get back into smoothies – the winter doesn’t make them very appealing (would rather have a hot chocolate than a cold smoothie!). But when we do make them, we use very similar ingredients – I don’t add milk though. Spinach, Kale, Romaine lettuce – all good! I think the berries really counteract any green color that could be there. More often than not we end up with brown! !Greta way to start the day though! I’d say 2 weeks out is fine.With a quick rampup you need to give somewhere and I’m thinking that would be it. Just be very easy for the “taper” and you should recover fine. Hi. I just found your blog and I have to say, I am so impressed that you are running Boston just 2 months after having a baby! That’s amazing. I started running again 3 weeks after my son was born and didn’t run a race until just before he turned 4 months. And it was tough! Good for you for getting out there and doing the marathon!